Is Flynn case the tip of the iceberg for the Trump administration? Is the Michael Flynn case just the tip of the iceberg for the Trump administration? Ex-national security adviser Flynn has admitted to lying to the FBI about his contacts with Russia. Under a plea bargain deal, he admitted making false statements when asked by FBI investigators about his conversations last December with Russia's then-ambassador, Sergei Kislyak, just weeks before Trump took office. And as Flynn left court in Washington on Friday, protesters cried 'lock him up' - echoing Flynn's own campaign trail taunts about Trump's Democratic rival Hillary Clinton. Now, however, Flynn is cooperating with a probe into the actions of Trump's inner circle before he became president. "General Flynn is one more example of the extent of ties between senior officials involved in the Trump efforts and the Russians," said Virginia Democratic Senator Mark Warner, Vice Chairman of the Senate Intelligence Committee. "How many more figures have to be brought to justice because of their ties with Russia before we end up connecting all these dots?" Could those dots be leading to the very heart of Trump's inner circle? US media reports say the president's son-in-law Jared Kushner is now a key focus in the inquiry, with the dramatic turn of events raising new questions about whether he had a role in those Russia contacts. "Flynn had contacted the Russians at the urging of two top transition officials, according to a court document. Three people familiar with the matter say one of the officials referenced in the document is Jared Kushner, President Donald Trump's son-in-law and senior adviser, and two people familiar with the matter say the other is K.T. McFarland, who served as deputy national security adviser from January to May." Law Professor Miriam Baer of Brooklyn Law School believes the Flynn case may cause 'other dominoes' to fall. "Usually prosecutors are very careful in their language," she said. "So if in one part of the statement of offence they refer to a 'very senior member', and if in another part they refer to someone as, for example, a 'senior official', that would suggest that they are looking at more than one person." Special Counsel Robert Mueller's probe into alleged Russian medding in the 2016 US. election and potential collusion by Trump aides has been branded a witchhunt by the president. 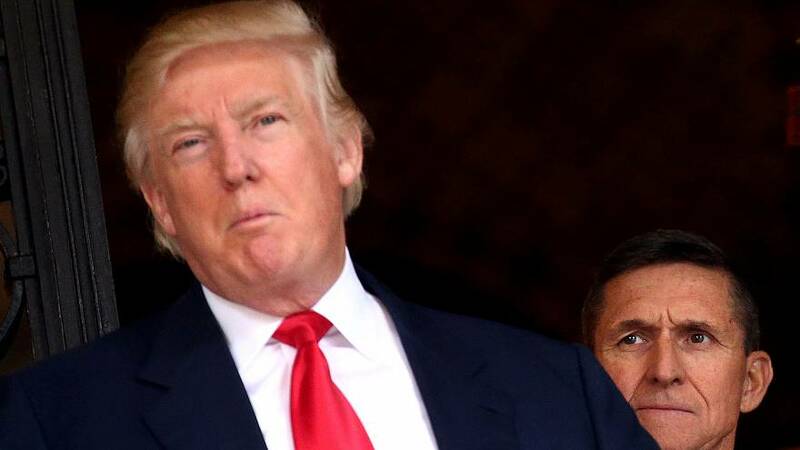 Flynn, a retired army lieutenant general, only served as Trump's national security adviser for 24 days.